i've stuffed you with fried chicken and then pork belly until you couldn't move anymore. next up is OYSTERS! the 3rd in the series of houston chowhounds chef throwdowns is coined the bivalve throwdown or #BVTD on twitter. bryan caswell and bill floyd from REEF are graciously hosting this shindig on Sun, Nov 8th from 4-9ish PM. BVTD chefs will be required to prepare 2 oyster dishes for the judges in this competition: 1 raw and 1 cooked. 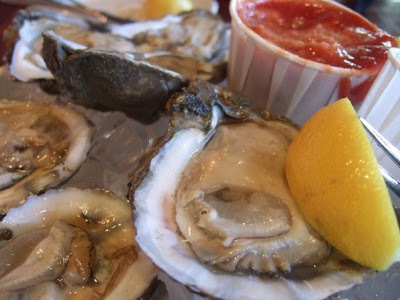 chefs will be able to choose from several varieties of live gulf oysters in the shell and freshly shucked oysters. all oysters will be provided for the competition, chefs will only need to bring their other ingredients. to compete, chefs must register by tue, 10/27. the final chef line-up will be announced on Mon, 11/1, so check back soon. the amateur chef potluck competition will be battle gumbo. 10 houston chowhounds will be competing for bragging rights in this contest that the home cooks take equally seriously. the event promises to be bigger and more impressive than the last. expect a shucking contest, several raw oyster bars with live shuckers, and -- as always -- a massive spread of gastrodelights. as always, a wild card judge will also be chosen for the panel of judges. if you would like to be considered, please submit a short essay on "why you should be a BVTD judge" to imneverfull@gmail.com by 10/31. for official event details and competition guidelines, click here. big thanks to the event sponsors, REEF, louisiana foods, and saint arnold.